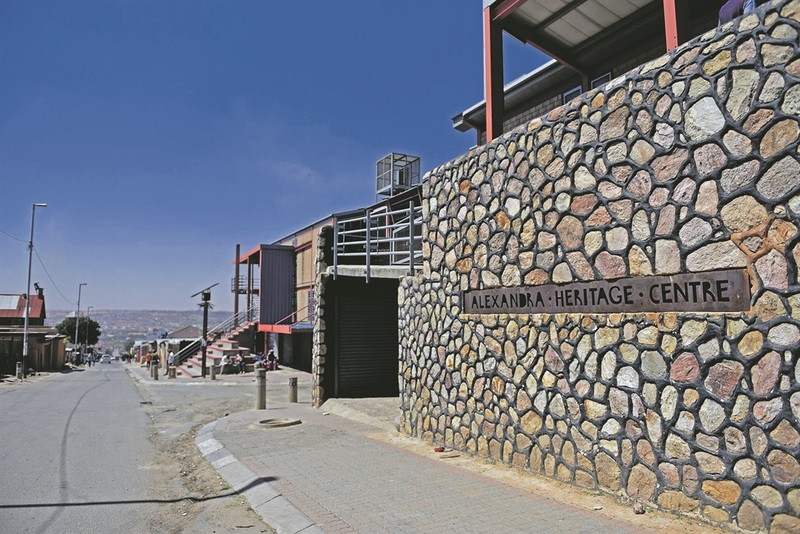 It has taken 20 years of efforts, driven by an architect, a community researcher, a heritage expert and an academic, but the Alexandra Heritage Centre is finally open for business. Two days after the death of the former president in 2013, a dispirited television reporter visited the Nelson Mandela heritage site in Alexandra township to see how the great man was being remembered. Mandela’s Yard is a single back room where he lived when he moved to Joburg from rural Transkei in 1941. It’s in a grid of yard housing built in a communal urban formation. These were once common across the continent and homed 10 families a yard. Originally these were earmarked for soldiers returning from the wars. Alex, the densely populated ghetto that neighbours the pristinely wealthy Sandton, was a transformative space for Mandela and he was radicalised here, the locals say. “There are few townships, including Soweto, that have such a rich history of the struggle for freedom … Alexandra was in the forefront,” says historian Noor Nieftagodien. Yet, unlike in Soweto, the reporter found no throngs of tourists in Alex. Moving from a mural of the beaming resistance hero in a suit and tie, hand raised in a fist, the camera rests on the distinctive-looking stone and metal Alexandra Heritage Centre directly across the road. Eight years after the main structure was completed, the centre is derelict, it is reported, “except for the young drug-users who hang out there”. 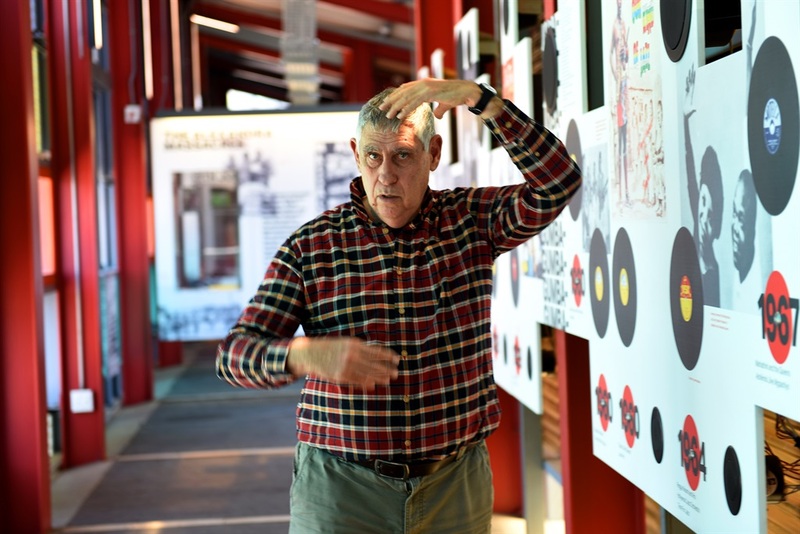 “Not a single brick was stolen,” says social history researcher Thabo Mopatsi about the past five years spent finishing off the compact Alexandra Heritage Centre precinct, its museum built in the form of an enclosed bridge over the road beneath it, windows flowering with colour, a ruckus of practical design by architect Peter Rich that feels a bit like the jazz that underscores the stories being told on videos upstairs. “The community supports what is happening here as long as we keep moving forward with the community’s buy-in,” says Mopatsi, discussing the forums involved on street level. 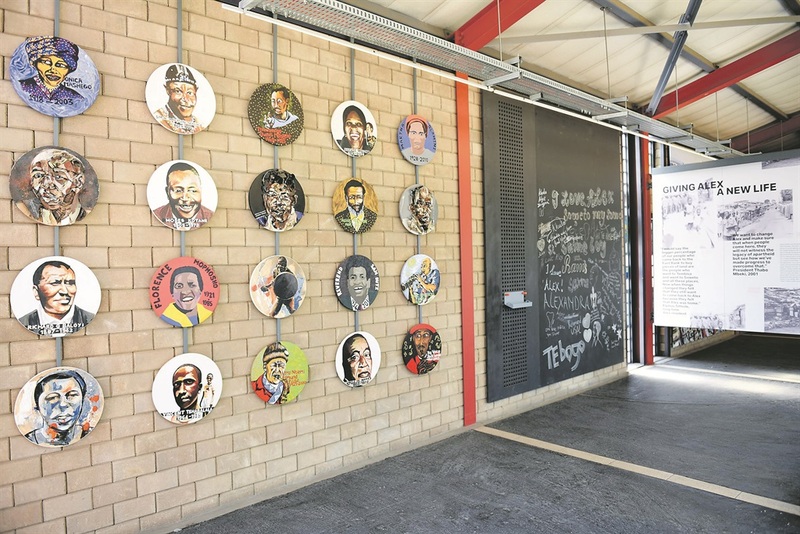 The project, originally focusing on a Mandela museum, a thatched craft centre and, one presumes, busloads of German tourists, was effectively born in 2001 when then president Thabo Mbeki launched the R1.3 billion Alexandra Renewal Project. In the 17 years that have followed, the centre’s development has stopped and started frequently, stalled through red tape and irregular funding, changing hands between various government departments, water and lights eventually delivered by the Johannesburg Development Agency’s final drive to bring it to life. But by then the baby was already a young adult and it had formed an identity of its own. It has been people like Mopatsi, Nieftagodien, Rich and heritage expert Jo-Anne Duggan who have kept the fires burning in the face of the spectre of a white elephant. 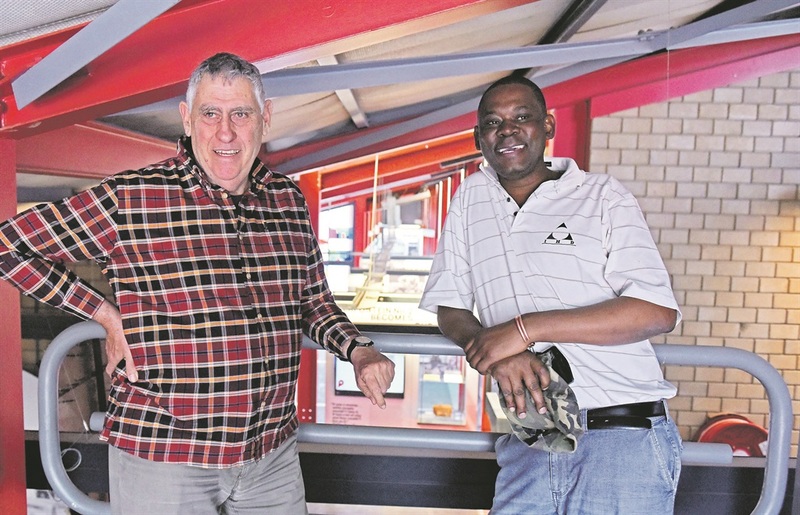 Rich, probably most famous for his majestic Mapungubwe Interpretation Centre, teamed with Duggan, then of The Heritage Agency, who won a competition to develop the site. Ten local enthusiasts, such as Mopatsi, were trained by Duggan to be historical researchers and an ambitious process of mapping the oral heritage of the area began, crystallising into an interactive museum where local artists crafted the finer details of the display. “Alex has no space, so the building becomes part of the street,” says the architect as we walk up the grand ramp to the entrance. It’s made from tarmac because symbolically it’s part of the road. Half way up is a “speaker’s corner” where you can even announce the start of the Alexandra Marathon. The entrance desk is crafted from concrete and above it a metal, animal bone and horn sign made by a local artist, reads “Alexandra: Mother of Diversity”. Nieftagodien has co-authored a book on Alex and he helped shape the presentation of the oral histories on display, which range from a land before the Boers to the present day. It blends with the voice of football supremo Irvin Khoza from another screen, recounting the apartheid state’s bulldozing of black-owned homes and how Alex resisted the beast whose shadow still looms over the museum in the form of the fortress-like women’s hostel above it and the inequality all around it. We’re looking at a display of everyday household items from history below a recording booth where residents and visitors can share and deposit their stories of Alexandra. One of the items on display is a decades-old dustbin lid. There’s a metal mealiemeal container, a wooden matchbox, shiny old shoes. Mopatsi was born and raised just down the road here, “number 26, 12”, where he still lives. The infamous Spoilers and Msomi gangs are in the mix here too, alongside former president Kgalema Mothlanthe, born and bred in Alex. He is telling of the dismay in the pit of his stomach when, in 1957, he’d wake hungry with the knowledge that he would have to walk all the way to town to work because he was participating in the famous Alexandra bus boycotts against the state’s tariff increase. The screens with the displays start to move and retract. The ever-optimistic 73-year-old architect is joyfully showing off some details of the design. 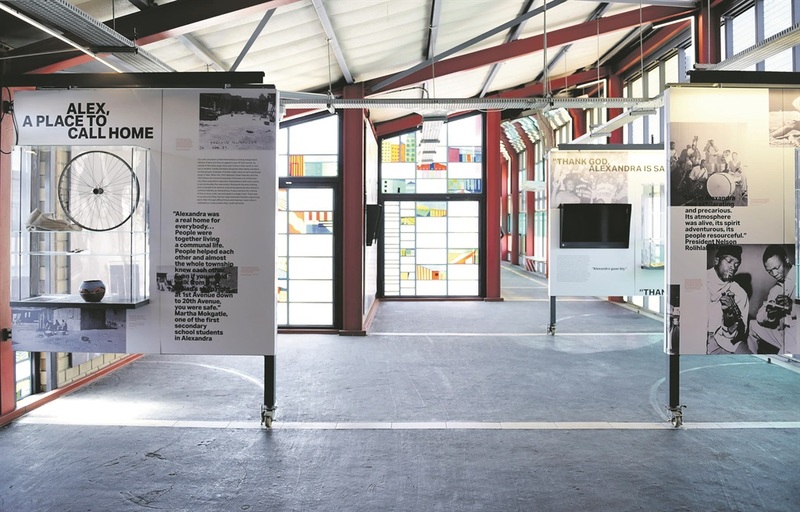 He moves to a large window dotted with glass painted by local artists, opening it wide on its customised hinges to allow the sounds of the street and its taxis to filter in to join the chorus. From up here in the museum you can see the centre’s precinct open into a dozen shuttered shop spaces, informal trading areas, an amphitheatre with a rough stage and even an outdoor movie screen. “All that’s still needed is the projector,” says Rich. We’re not here to talk about his work being celebrated at this year’s Venice Biennale of Architecture, or the fact that the arts ministry did not manage to get its national pavilion together for the same show, but about the soil bricks, metal and coloured polycarbonate sheeting that forms the shell of a structure designed for communal inclusion. Where we are walking, past a wall of vinyl records across the bridge, songs activated by touch, “tile cut-offs from rich people’s bathrooms” become a kind of mosaic forming the floor. The wall of jazz, kwela and gumba is reflected in a mirror ceiling above, the road beneath you. Past a computer that allows visitors to type messages into screens and a workshop space that features a wall designed to display art, hopefully children’s art made onsite, one reaches the other side and a metal viewing platform with an epic view of the contained spread of Alex. The yards surrounding Mandela’s have also been incorporated as a heritage site and could be upgraded next. “Sixteen heritage sites have been identified here and there is a heritage tour proposed,” says Mopatsi as he and Rich point out the graveyard, the cathedral, the place of torture, Motlanthe’s Anglican school, Palladium Hall where Samora Machel used to stay when he was living here as a student in the 1960s, King’s Cinema, the Women’s Hostel, the beer hall, a Catholic church. There are fewer signs of the future than the past here. A grand football field is being finished as part of a Football World Cup legacy project, a Gautrain station in the distance, a cricket oval opened by Queen Elizabeth. Rich says corporates and international agencies are standing by to support the centre, which has now got core staff, but there are still some wrinkles to be ironed out. “We’re 99.6% there,” he says, pointing to Ikasi Gym next door, famous for visits by Richard Branson and for Arnold Schwarzenegger’s endorsement and his donation of the gym’s heavy-metal equipment to local body-building hero Tumi. “We’re wondering how we can build on to the structure to incorporate the gym into the centre’s design,” says Rich. “The most important thing is we know how to make this building part of the community,” says Mopatsi. The Alexandra Heritage Centre is at 4694 Hofmeyr Street and is already open to visitors from Tuesday to Sunday from 10am to 5pm.